Not sure about you guys, but I’m always AMAZED by how quickly time flies this time of year. During the first week of November, Halloween feels like it either happened months ago or never happened at all. By mid-November, time has completely warped and I can’t tell difference between morning, afternoon, and night, and certainly can’t be bothered to remember what day of the week it is. It might have something to do with the time change, or the all-consuming fear of impending sucky weather, or the craziness of working retail during the busiest of all retail seasons, but it’s mostly my tendency to completely zone out when busy and stressed. Finally having time to sit down and look at a calendar, I realized it was Tuesday again. Already? Wasn’t it just Tuesday? I didn’t have time to bake something new and exciting for my breakfast post and was pretty bummed out. I went about my morning business, earlier than usual on account of being busy, and prepared a dish that has become part of my weekly breakfast routine. I had a mini blog-piphany, thinking about how food only makes it into my meal routine if it’s amazing and thinking that it’s high time I share this particular recipe. 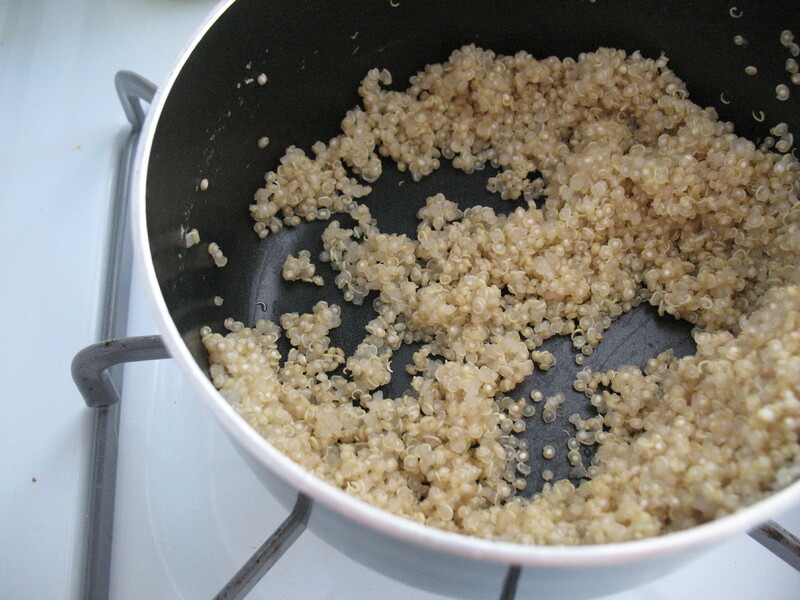 So, while I’m shaking my fists at the sky and wondering what the HECK happened to my week, I leave you with one of my favorite breakfast recipes: baked quinoa. It’s super easy and super satisfying, and I guarantee you’ll find yourself wanting it again and again after making it once. The only change I make is to add one egg instead of two, and sometimes I vary the level of sweetener, depending on my topping of choice. Happy Breakfast Tuesday, everyone! Being busy means less time writing and photographing the food I make, but for some reason being busy also means I spend more time sneaking into cafes for breakfast and coffee with close friends. Hmmm. Today feels a good day. To me, a good day doesn’t necessarily mean that everything goes my way, or that everything is perfect (and yes, I do have a mental hierarchy of what constitutes different days that could be considered “good,” yay for having a selectively analytical mind). This particular type of good day has nothing to do with anything other than me, sitting in my kitchen, and the space around me; everything seems beautiful and uniquely interesting. I find myself smiling at all the ingredients I’m using for breakfast, even though they are either splayed all over the cutting board or smeared on the counter, and being fascinated by the way my coffee swirls in its cup. On these days, I’m acutely aware of being human in the physical sense, and heartily enjoy the simple sensory pleasures one can very easily overlook. I just get so wrapped up in my head, what with being stressed about this and that, feeling bad about something that happened the night before, and missing people who live far away, but today I feel like I can be a girl in a kitchen, smelling her warm, delicious coffee and waiting for chocolate chip pumpkin squares to come out of the oven. 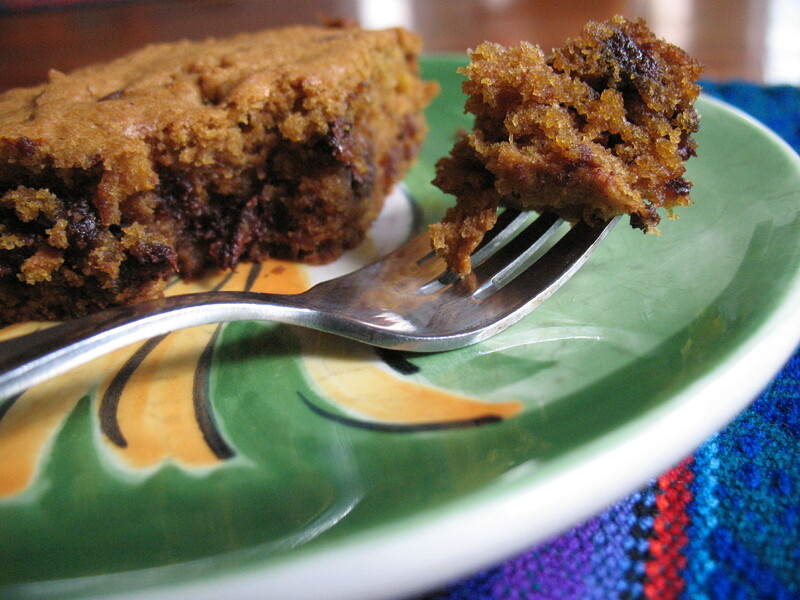 These chocolate chip pumpkin squares, not quite blondies and not quite cake, are perfect for a good day like this because they are basically small squares of sensory overload. The squares smell like fall and brown sugar, look all orangey-pumpkin beautiful with melty chocolate chips, and, warm from the oven, melt in your mouth. I would even go so far as to say these chocolate chip pumpkin squares could turn a not-so good day around, because you can’t help but stop, smell the roses, and enjoy! Notes: The original recipe calls for all-purpose instead of cake flour and granulated sugar instead of brown sugar, but I love the fine crumb of cake flour and the slight hint of molasses that come together in the finished product. Come next time, I might sprinkle chopped walnuts over the top before baking. 1. Preheat oven to 350 degrees F and line a 9 by 13 inch pan with parchment or greased foil, leaving a few inches overhang to pull bars out of pan once baked. 2. In a medium-size mixing bowl, whisk together flour, spices, baking soda, and salt. Set aside. 3. In a large mixing bowl, cream butter and sugar until smooth. Add egg and vanilla, and then mix until smooth. 4. Add dry ingredients to wet and stir just until all streaks of flour disappear, taking care to scrape the bottom of the pan while stirring. Stir in chocolate chips or chopped chocolate. 5. 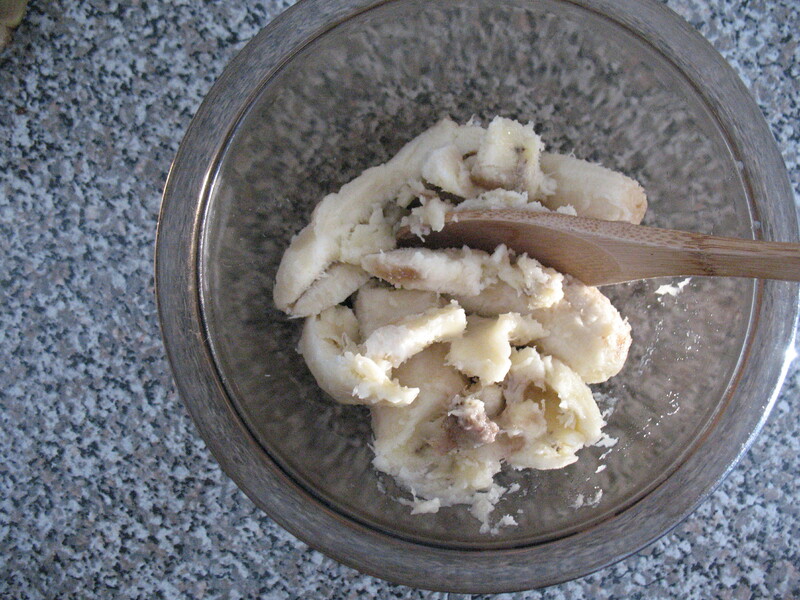 Spread batter evenly in prepared pan and smooth top. Bake in preheated oven 35 to 40 minutes, or until a cake tester inserted in the center comes out with a few moist crumbs attached. 6. Let pumpkin squares cool completely in pan before lifting out and cutting into individual squares. 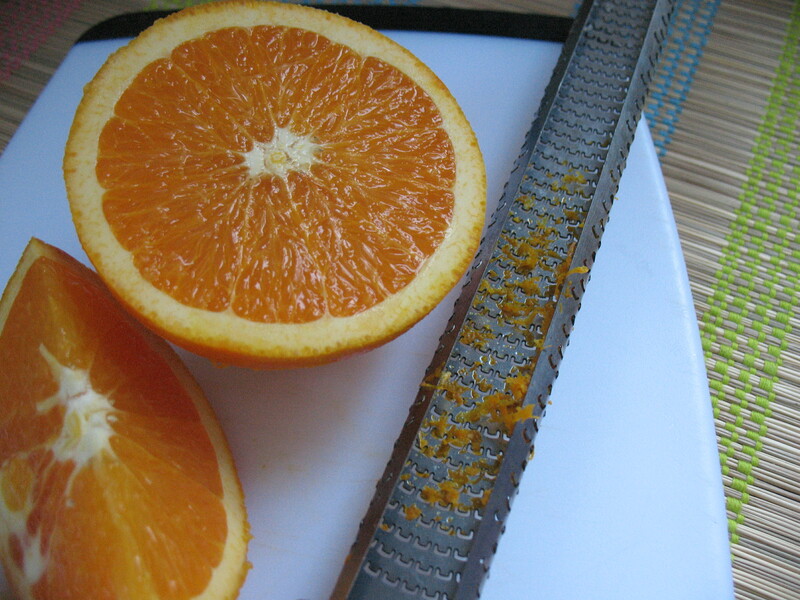 Bars can be kept at room temperature, in an airtight container, up to 3 days. It’s common knowledge that the most surprising discoveries are those made completely by accident. Today I’m able to present the successful and exciting result of what seemed like a tragic slip-up. The short back story has a little to do with buying grains in bulk and a lot to do with the fact that I should really write things down so I don’t forget. 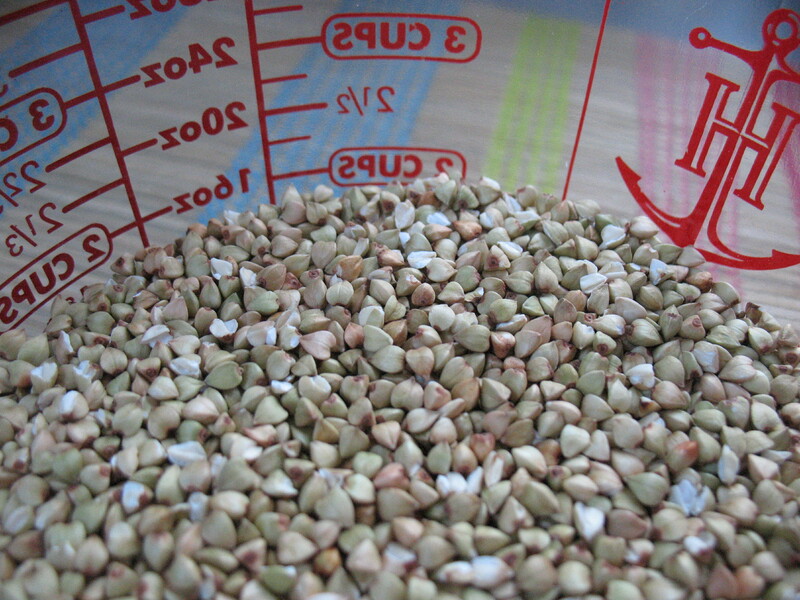 The end of the story is that I came home with some buckwheat groats and had no idea what to do them, or even what to make of them, and almost hit a proverbial wall. I’m pretty new to buying and using whole grains, so I was standing in front of a small bag of buckwheat groats and feeling like I might as well be looking at pictures of previously unexplored alien landscapes. Thank goodness, though, for both the internet and the abundance of talented, creative cooks out there. 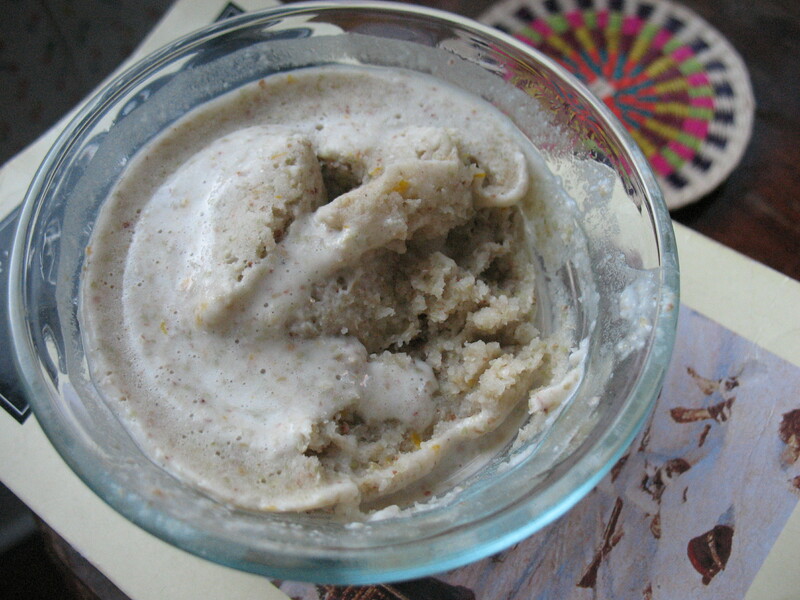 When I found a recipe for raw buckwheat porridge, I stopped in my tracks. Firstly, YUM porridge. Secondly, raw food! I’ve always been curious of raw food but my love of baking always drove me in the opposite direction. I soaked the groats, which was an adventure because they get slimy and downright funky feeling but I read that it’s totally normally, and sallied forth, blending all the ingredients together. The final product was definitely interesting. I liked the taste but I would need a bit of time to get used to the texture. Since I wasn’t thrilled by the texture, I decided to heat it up because my food texture issues dramatically decrease with an increase in temperature (and I really wanted to like it). In heating it up, however, the buckwheat porridge BAKED! The texture was very similar to baked quinoa, which makes sense. I wasn’t a huge fan of the raw porridge, but I love the baked version! I ended up devouring the baked buckwheat porridge and going back for seconds, smothered in jam and almonds. I can’t wait to bake this porridge with pumpkin puree, or peanut butter, or chocolate! 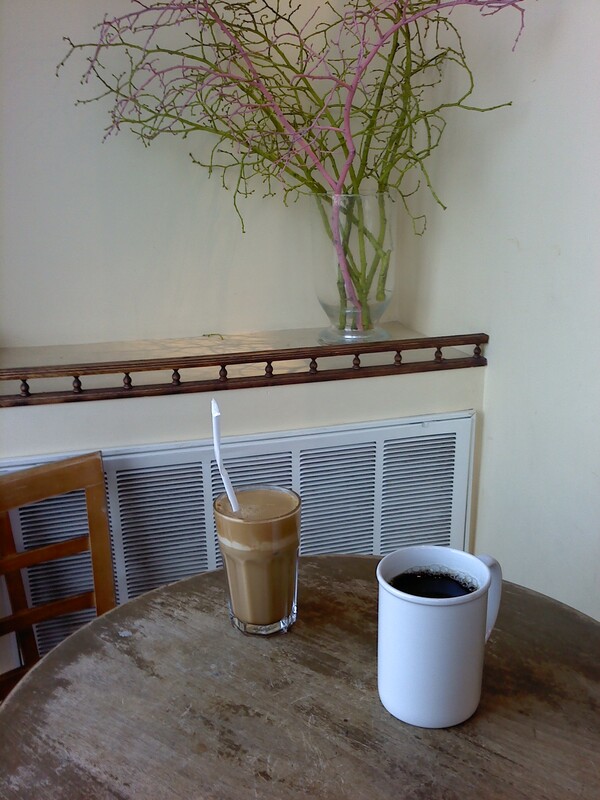 Happy Breakfast Tuesday, and cheers to new and exciting discoveries! 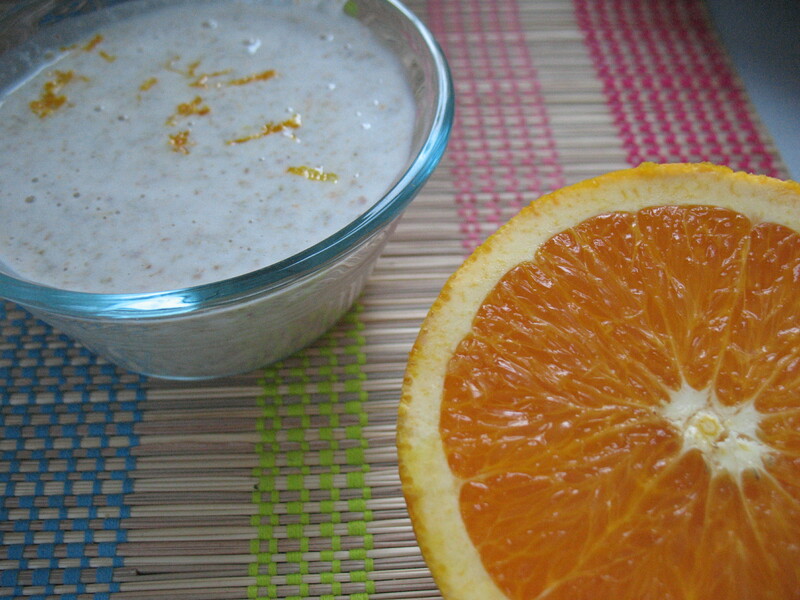 Notes: Like most porridge recipes, buckwheat porridge is super easy to customize. I added 1 ½ teaspoons orange zest and ¼ teaspoon cardamom to my first batch, but plan on making different batches with combinations of different ingredients, like pumpkin, cinnamon, coconut, almonds, jam, peanut butter, raisins, and chocolate. In place of the honey, you could use any other liquid sweetener of choice, like maple or agave syrup. 1. In a large bowl, combine groats and 4 cups water. Soak at least one hour or overnight. 2. Rinse groats 2 to 3 times using a fine metal sieve. Set a half cup of groats aside. 3. In another large bowl or food processor, combine the rest of the soaked groats, milk, honey, salt, vanilla and spices or zest of your choice. Blend all ingredients together. 4. To serve raw, simply scoop into bowls and top with toppings of choice. To serve baked or slightly baked, microwave individual servings for a little less than a minute. Store leftover porridge refrigerated and in an airtight container up to a week. One would think that, after almost one documented year (!) of consistent baking and the many undocumented years prior, I’d know how to read a recipe, or at least know how many times I need to reread a recipe in order to bring a baked good to delicious fruition. Colleen tries to make soft pretzels, take one. Action! 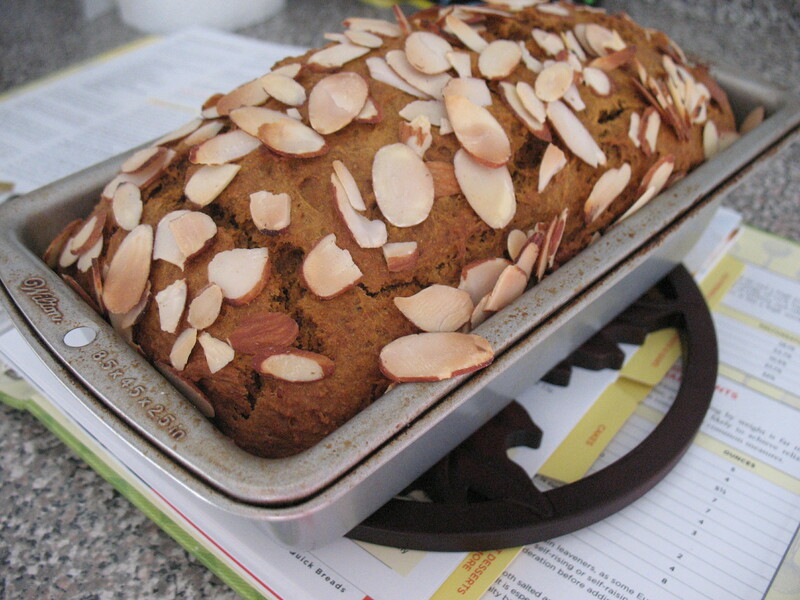 After reading the recipe in its entirety, I read down the ingredients once more to start working on the recipe. I reread the first step and saw that you have to combine everything in the same bowl to make the dough. Really, really, excruciatingly simple! I added the yeast, honey, salt, flour, warm water, and then added the baking soda. As I was adding the three tablespoons of baking soda, I kept thinking how strange it was that you would add so much of a chemical leavening agent to dough that already has one, yeast. If this were a movie, you’d see me in the kitchen with a dramatically exaggerated confused look on my face as I added tablespoon after tablespoon of baking soda, and the text at the bottom of the screen would read, “Weeeeeeeeeird”. If you’ve seen the first Bridget Jones movie, it’d be like the scene where her handsome boss catches her in a lie trying to impress him and there is a not so appropriate expletive that runs across the bottom of the screen while she is looking at him with an expression of total fear and embarrassment. Not the same emotion, but the same concept and funny image. 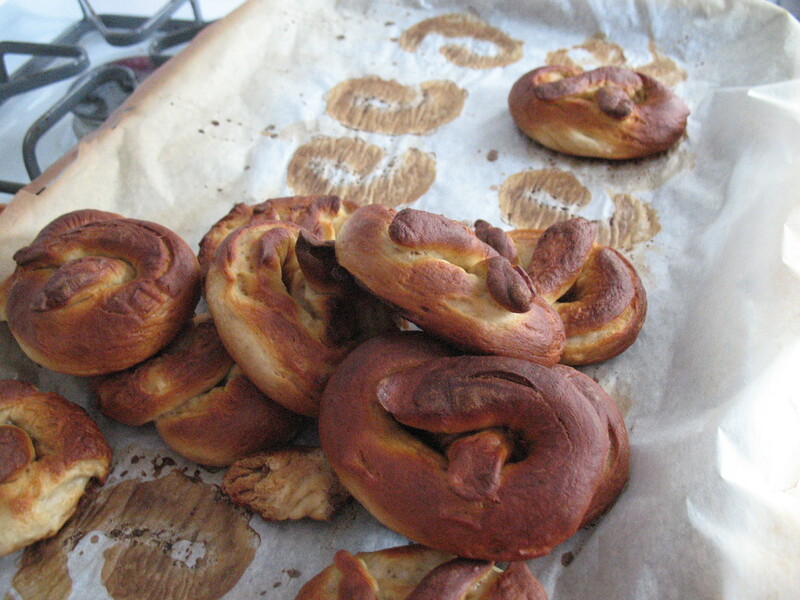 Soft pretzels are unique because they, like bagels, are boiled before baking. Soft pretzels are boiled not just water, however, but in a baking soda and water solution so they get that characteristic brown coloring. I realized my mistake when I went to boil the water, and couldn’t NOT finish the recipe. I rolled out the dough and shaped the pretzels, which was super fun, then got to boiling and baking. The pretzels were beautiful. Inedible, on account of the baking soda mistake, but beautiful nonetheless. The insides were soft and fluffy, and would have been perfect had I not buggered up the baking soda bit. I can’t wait to make soft pretzels again, though, knowing how much fun the process is, and how great the finished product will be! Notes: Soft pretzel dough is super stiff, almost too stiff to knead by hand. ATK recommends using a stand mixer or food processor because pretzels come out most flavorful with the appropriate amount of kneading. I’m writing the recipe for a stand mixer, but check out the book if you want the food processor method. Also, check out the book for cheese and cinnamon sugar variations of this recipe. When rolling out pretzels, I found the dough worked best on a surface that was not floured, even though the recipe recommends rolling dough on a lightly floured surface. 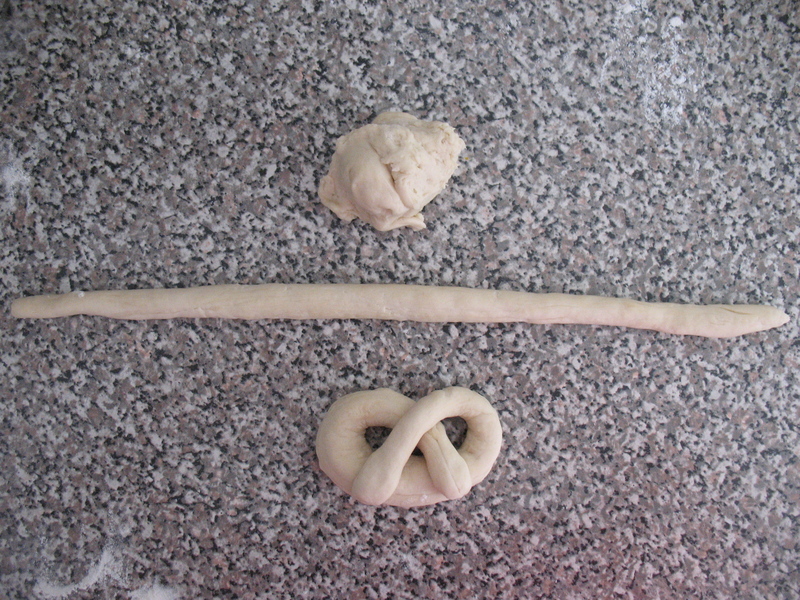 I also did not roll my dough into 20-inch long ropes, resulting in small, chubby pretzels. To each her own? 1. 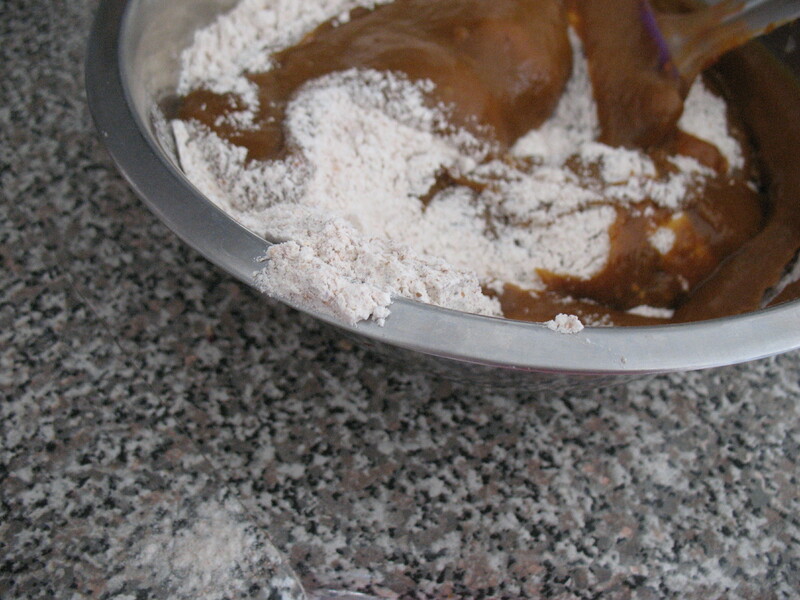 In the bowl of stand mixer, stir together yeast, honey, salt, flour, and water. 2. Fit mixer with a bread hook and knead dough at a low speed 5 to 7 minutes, or until dough forms a smooth, elastic ball. Coat a large mixing bowl with a thin layer of cooking oil. 3. Place ball of dough in oiled bowl, flipping dough over so the top is oiled, too. Cover bowl with plastic wrap and let rise in a warm place until doubled in size, 1 to 1 ½ hours. Deflate dough, cover again with plastic, and let dough rise until doubled in size for a second time, between 30 and 40 minutes. 4. Preheat oven to 450 degrees F. Line a large baking sheet with parchment or lightly oiled aluminum foil. In a 12-inch skillet, Dutch oven, or wide pot, bring 6 cups of water and baking soda to a boil. 5. While oven is preheating and water is coming to a boil, form pretzels. Divide dough into 12 equal portions. On a lightly floured surface, roll each portion into a 20-inch long, ½ inch wide ropes. Shape ropes into pretzel form by picking up the ends and crossing them over each other to form an oval and pressing ends over the bottom of the oval. It helped to pinch the dough together there, but a dab of water will also help the ends adhere to oval. 6. When water is boiling, use tongs to place 3 to 4 shaped pretzels face down in boiling water. After 30 seconds, use a slotted spoon to flip pretzels. After another thirty seconds, use tongs to drain pretzels thoroughly and place them directly on prepared baking sheet. Repeat until all pretzels are boiled. Since pretzels will not spread, you can try to fit all 12 pretzels on the same baking sheet. Sprinkle pretzels with salt, if desired. 7. Bake pretzels in preheated oven for 12 to 16 minutes, until pretzels are well browned, turning the baking sheet halfway through baking time. 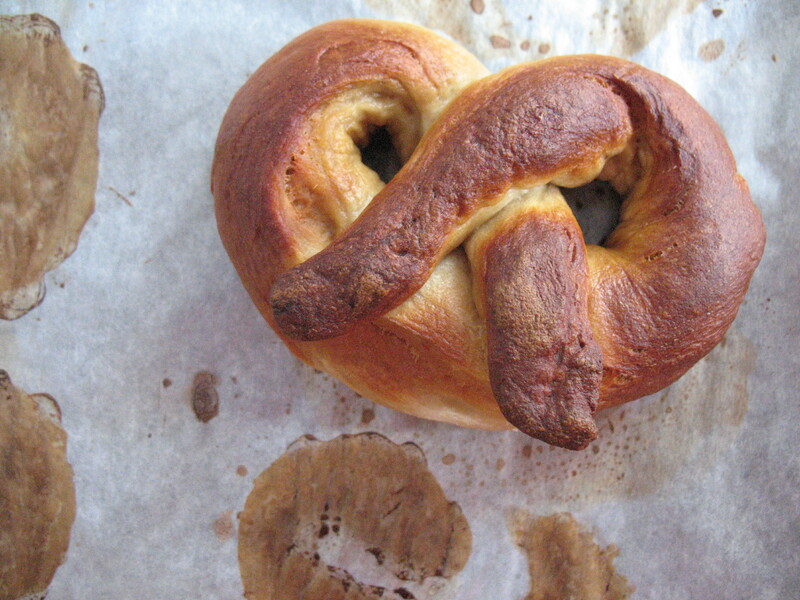 Remove pretzels to a cooling rack and cool until cool enough to eat or room temperature. ATK says pretzels are best the day they are made, served either warm or at room temperature, but will also keep for two days at room temperature in an airtight container or frozen up to 2 weeks. Bananas. I’m not sure I could do with out them. So you’ll understand my feelings when, right after returning home from the grocery store, I dropped my precious four bananas on the ground. The horror! Dropping any fruit is bad, but I feel like bananas take it the worst. The insides turn to banana pulp! Crazy! And the way I dropped them was such that more than half of each banana was horribly bruised by the impact. I tried opening one to eat but couldn’t do it without a spoon, and I was a little put off by the bruising. Feeling sad and defeated, I put them in the fruit basket and tried to forget about the whole incident. 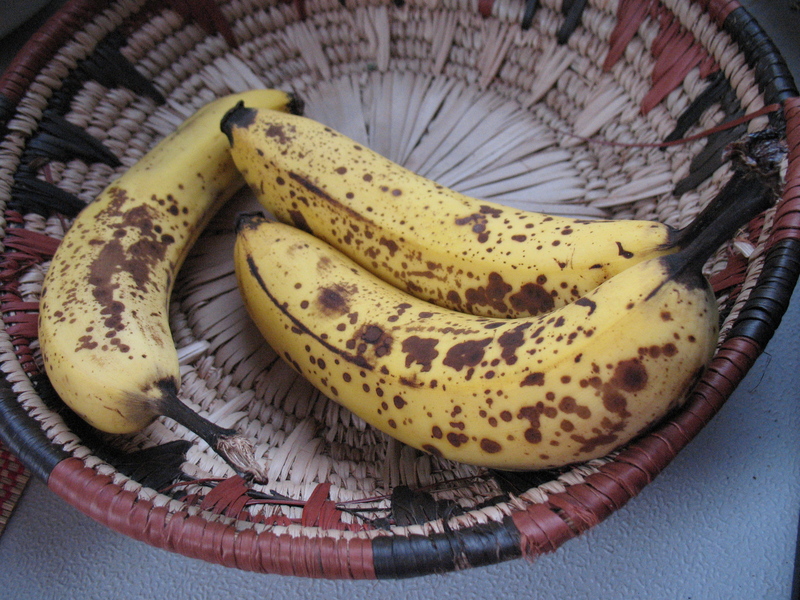 About four days later, the bananas started to get spotty. I was worried; I didn’t want to throw them out but didn’t want to eat them as is. What was I to do? A little voice sounded inside my ear and said things like, “You bake things! Bake banana things! You paid for those bananas! Use them!” I usually eat bananas too quickly to allow them to ripen, which means I don’t get the chance to bake with them. Not this time! So all is not lost, in fact, my love for banana baked goods is found again, especially with these waffles. The banana flavor isn’t pronounced, but you know it’s there, and you’ll love how the banana is complimented by oatmeal, cinnamon, and raisins. I’m going to count the banana dropping as a blessing this morning (but I promise to be more careful next time). Happy bananas for breakfast! Happy Breakfast Tuesday! Notes: Instead of using both all-purpose and whole-wheat flour, you can use one cup and two tablespoons all-purpose flour. If you decide to use quick cooking oats, you don’t need to soak the oats in liquid mixture before adding to dry ingredients. If you don’t have nondairy milk on hand and/or don’t require waffles to be vegan, substitute whatever milk you have on hand. 1. In a large mixing bowl, whisk together flour, baking powder, baking soda, cinnamon, and nutmeg. 2. In a medium-size mixing bowl, mix together oats, banana, milk, syrup, and vegetable oil. Let mixture soak for 10 minutes while you preheat the waffle iron. 3. After ten minutes, pour wet ingredients into dry and mix just until combined. A few lumps will remain. 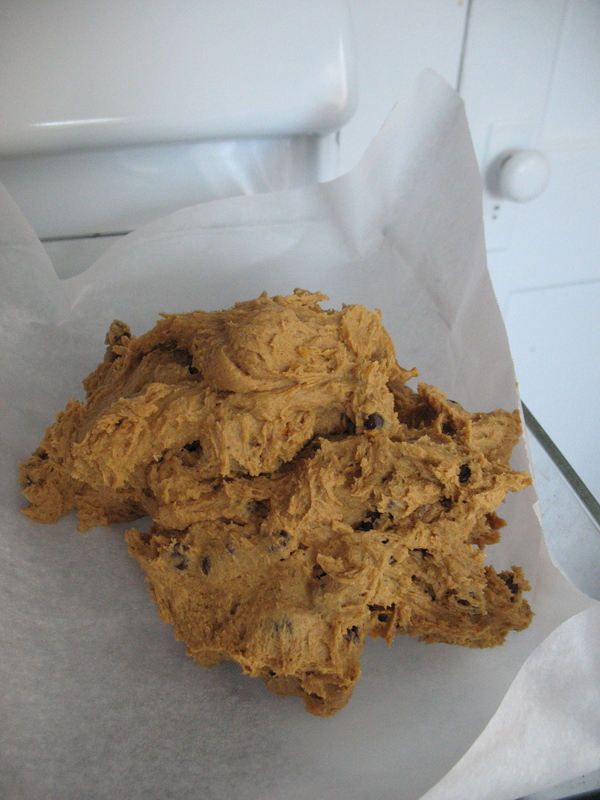 Fold in raisins, taking care not to over mix. 4. Waffle according to manufacturer’s instructions, greasing waffle iron between waffles. If you would like to keep the waffles warm between taking them off the iron and serving, preheat the oven to 200 degrees while the oatmeal is soaking and keep waffles in the oven, on a baking sheet lined with foil, up to 30 minutes before serving. 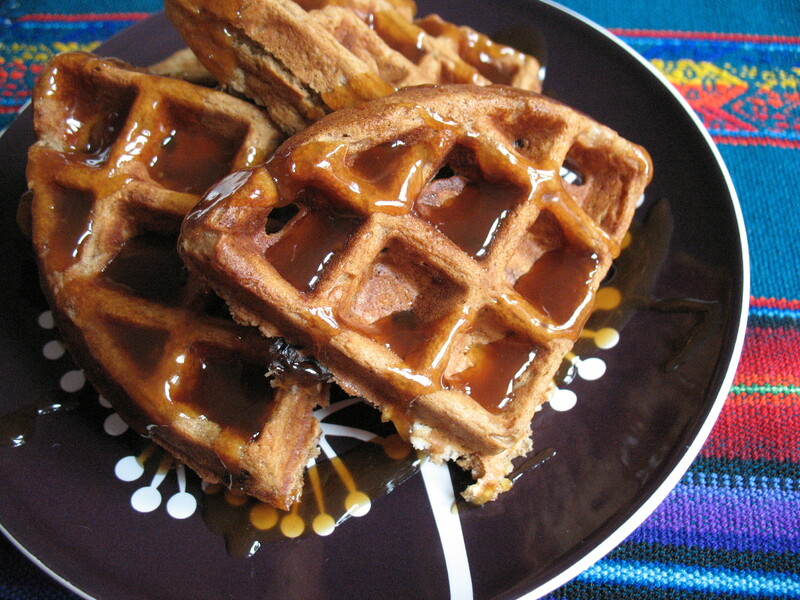 Waffles will keep, refrigerated, up to a week, and frozen up to a month. 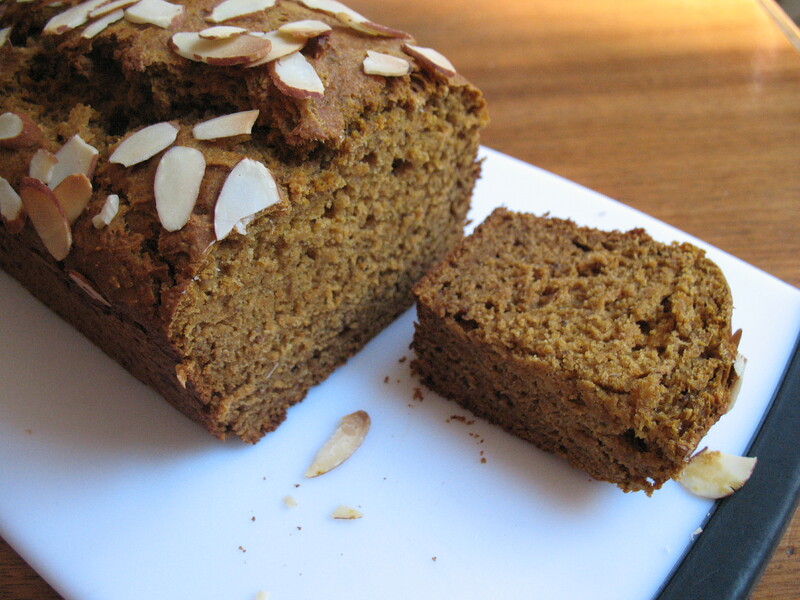 For the last few weeks, I’ve been drooling over all the baked pumpkin and squash recipes popping up all over the blogternet and I’ve been scheming to make them all. Make all the pumpkin pies! All the pumpkin doughnuts! All the muffins! Hurrah! You’ll notice, however, there has been not one pumpkin, or winter squash, recipe featured on this blog, at least since last fall/winter. It surprised the heck out of me, honestly, because not only have I been fantasizing about winter produce for dessert, but I’ve also been buying and eating the stuff. I buy squash, find a recipe two seconds later, and then all of sudden I’m eating it for dinner, lunch, breakfast, leftovers, you name it. Winter produce doesn’t last long enough in my house to make its way into dessert, apparently. I keep getting stuck on the fact that none of my winter squash pursuits involve dessert. Who am I? I didn’t think I was the kind of person who’d buy a butternut squash just to put it in a galette, or the kind of person who would seek out acorn squash because I’d just found a really intriguing dinner recipe. When did it happen that I see dinner and dessert as equals, taking as much care to make a good meal as a good dessert? I’m starting to have as much fun cooking as I do baking, and starting to enjoy savory food as much as sweet food. It’s news to me, but not bad news. You know, I was always scared that getting older would mean I’d find things less interesting, but it’s turning out to be quite the opposite! Now, on to today’s recipe for pumpkin cornbread pudding! To accompany dinner the other night, I threw together some crazy delicious cornbread for dippies (yes, I’m five years old). Sure enough, I had more than half of the cornbread lying around a few days later, along with just a tiny bit of pumpkin puree used a day or two before, and got it into my head that I’d make cornbread pumpkin bread pudding. I’d be using up stale cornbread AND eating pumpkin for dessert! After doing a little research, I found very few cornbread pudding recipes using cornbread cubes, and virtually no scaled-down recipes for such a dessert. The goal of today’s recipe was to create a breading pudding for two, using cornbread instead of white bread. I did some tinkering, and enjoyed the pudding, but there are a few things I would do differently next time. For instance, even though the cornbread cubes were super stale, they still baked together, making it more Indian pudding than bread. I also found that it wasn’t as sweet as I thought, making it super easy to adapt the recipe for savory cornbread pudding. Take a peek at the recipe notes for details, and if you have any ideas for improving the recipe, let me know!! I’d love any and all suggestions! Notes: If your cornbread isn’t terribly stale, you can leave cubes out overnight or bake, sspread evenly on a baking sheet, in a 200 degree F oven for 45 to 50 minutes, stirring cubes halfway through baking time. You could also add nuts or raisins to bread pudding by sprinkling about ¼ cup of either (or both?!) over custard and bread cubes before baking. I found the final product to be really eggy, tasting more like a slightly sweetened breakfast treat than dessert, even with the syrup. The next time I make this, I’ll probably use one egg instead of two, and decrease the amount of milk by a ¼ cup, using 1 ¼ cups milk total. This will probably mean decreasing the baking time, too. 1. Butter a baking pan with a 3-cup capacity, in this case I used a 6-inch round cake pan. Place cornbread cubes in greased baking pan, making sure to spread them evenly. 2. 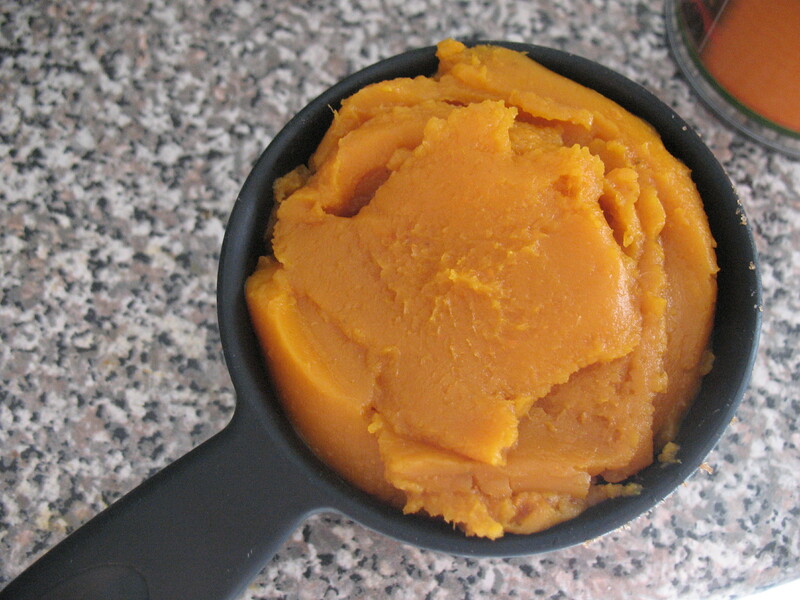 In a medium-size mixing bowl, whisk together eggs, milk, honey, and pumpkin puree, until smooth and completely combined. 3. 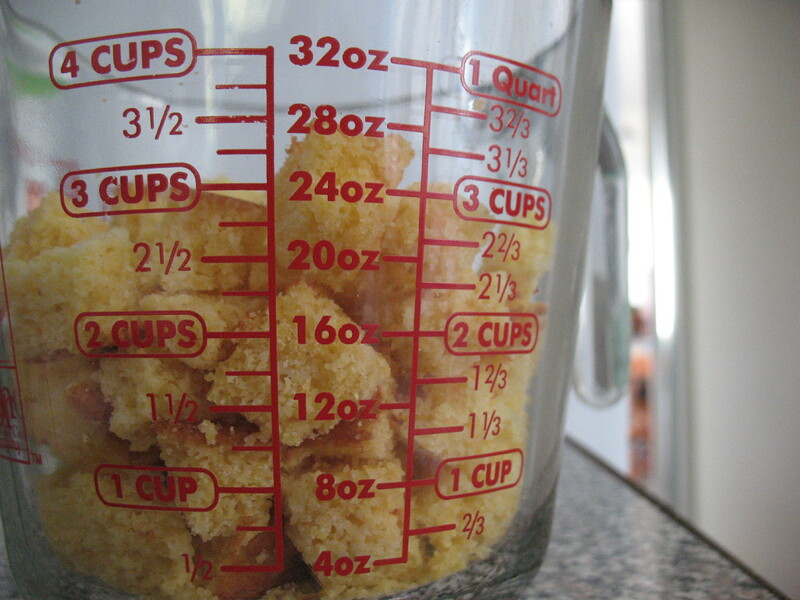 Pour milk mixture over cornbread cubes. Preheat oven to 325 degrees F, allowing bread pudding to soak while oven is preheating. 4. Place baking pan on a baking sheet and bake bread pudding 45 minutes to an hour, until edges are lightly browned, middle is slightly puffed, and a cake tester comes out clean. 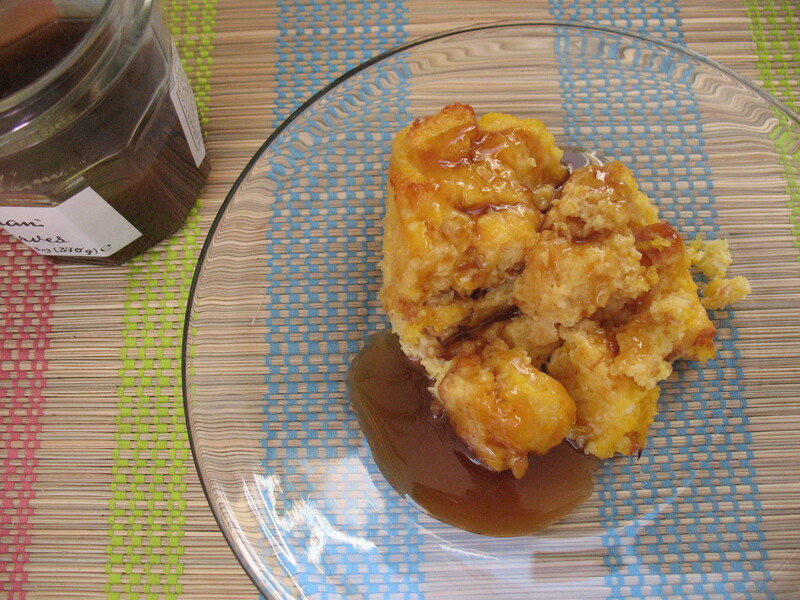 Serve bread pudding warm, and, if storing, keep covered and refrigerated up to 2 days. 1. Stir together sugar, cornstarch, and cinnamon in a small saucepan. 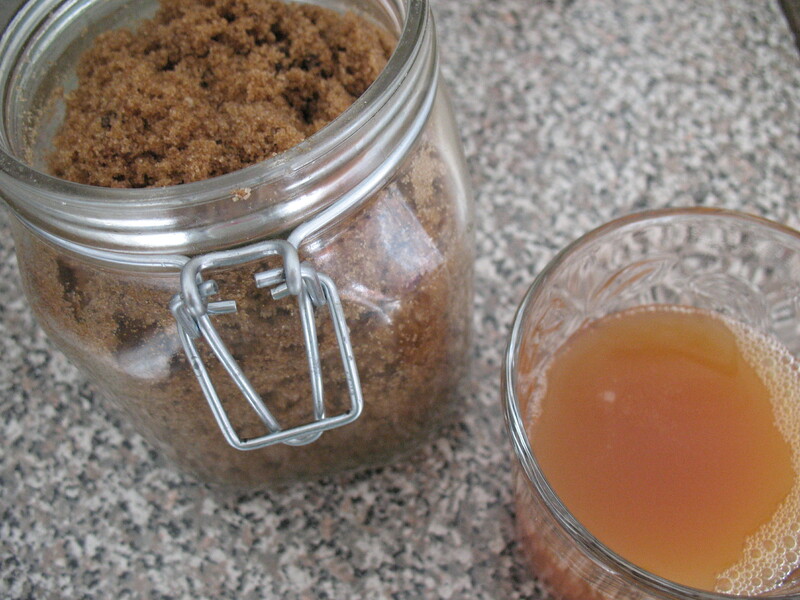 Stir in apple cider and lemon juice. 2. Cook syrup over medium heat until mixture begins to boil, and then boil until syrup thickens. 3. Once syrup thickens, take off heat and stir in butter. Serve syrup either warm or cold, and store syrup refrigerated, in an airtight container, up to a week.